Download DA Form 1059-1, also known as the Service School Academic Evaluation Report. 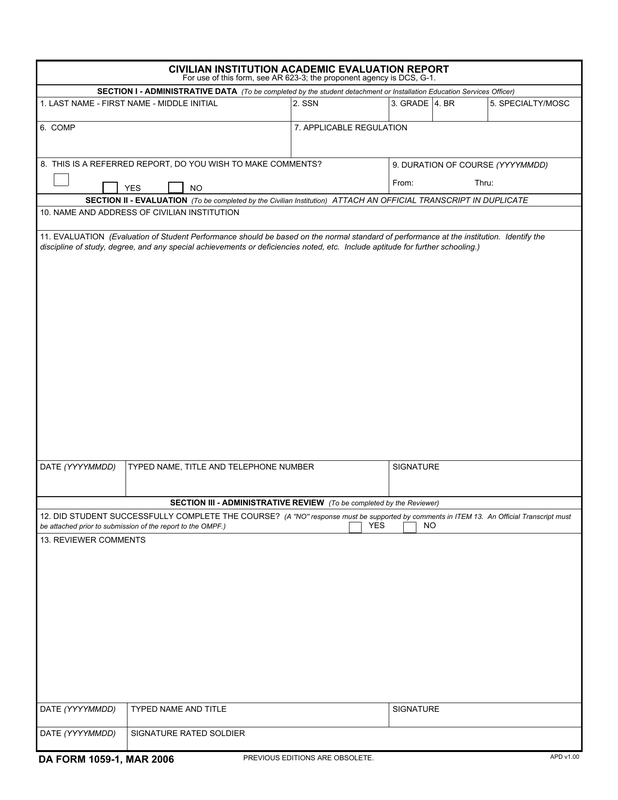 This form is used by raters and reviewers to evaluate the progress of a soldier who is continuing their education in a civilian institution. This program allows soldiers to attend civilian schools to enhance their education, with financial assistance as long as they are progressing. Step 4 – Block 13. – Has Student Demonstrated The Academic Potential For Selection To Higher Level School/Training? Step 5 – Block 14. – Comments – This block is intended for the rater to provide a word portrait and must completely and accurately provide information on academic performance. Read the instruction on the form carefully and respond in your own words. Remember to place comments from Blocks 11., 12. and 13. as well, should they apply. This form is fillable online and/or printable for manual use and/or sending.